Battle 040 – Exigence Release, Cygnar vs Trolls, Siege vs Madrak: PacMan THIS, Fothermucker! On Saturday I ran an Exigence Release Event… my first game with Siege versus Skorne didn’t go so well… turns out that a charging Kovaas on Zaal’s Feat Turn is apparently quite capable of killing Siege. Who knew? 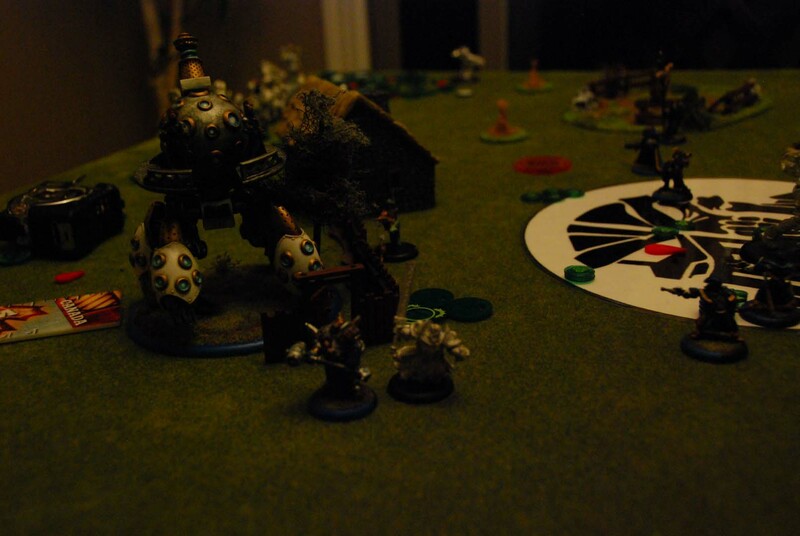 But with that game out of the way, I was able to also squeeze in a full game (and the following report!) between Siege and Madrak… I’ve heard whispers of the power of the PacMan Feat, but this would be my first time seeing it in anything other than a Battlebox game! Podcast game! Circle! Electric Swans! Big freakin’ rocks with big freakin’ arms that beat steam powered robots to death! My apologies again… somebody thought it would be a good idea for me to take the pictures, and as a result they all look like they’re taken at midnight on a moonless night in a closet deep within a cave. Hopefully you can make out what happens! In addition to the game that Nick and I reported on for the Podcast this week, we also got in a 2nd game… basically, we finished so quickly that we had the time to set up and try again! Nick was eager to see if he could iron out the kinks in his Rahn list, and I really wanted to get Siege on the table at least once… so the list selection was very easy. We rolled for initiative, which Nick won, and I picked the same side of the table as last time for the same reasons (concealment in the zone). We decided to stick with Process of Elimination for the scenario (two 12×6″ zones with an objective that contests in the middle) out of convenience more than anything. Pitted against this swarm of elven terror were my few… my proud… my Siege list. As you can tell, I probably went a little too heavy into the “not a lot of models” side of the equation… but I really, *really* like what the Storm Lances can accomplish with Siege. The main problem is that Siege also really needs a Squire… well, “need” is a strong word. He certainly LIKES a Squire, but there’s simply no room for one in this list.